I started a Twitter account, @StartupPerth, back in August of this year, after much thinking in the months prior. The issue for many early stage startups, both in Perth and afar, is getting some traction generally, but also traction for their content marketing and social media accounts. I’m trying in a small way, to address this for my fellow Perth founders. It seems to have been well received; in the last four months, it has grown to a reach of over 38,000 and a following of 2,047 real followers, mostly WA or Australian based. If you are among those followers, thanks so much! This is all great, but I want to see this achieve more. I wrote about the account over on Medium not long after I launched it, however I wanted to expand on my thinking here. Twitter is one of the best social media platforms for sharing, particularly in the startup space. 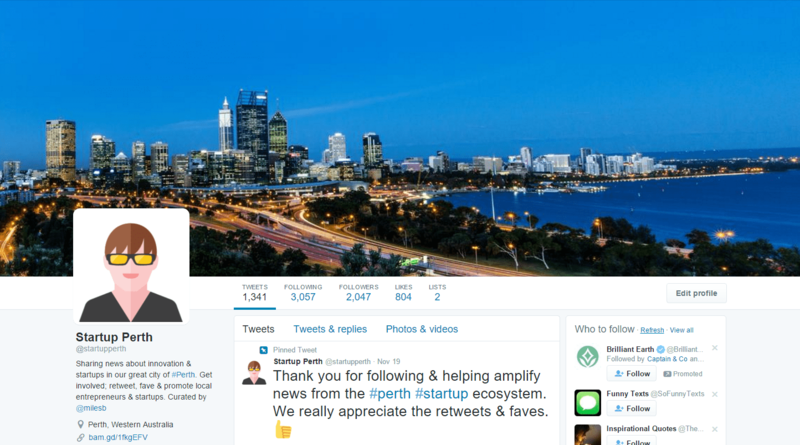 There are some great other resources for local Perth startups to get some attention, such as Startup News and Techboard, however for all those reasons above, I saw a need for something entirely Twitter-based. So here’s my solution. Follow @StartupPerth, and when you see a tweet from a founder or startup you like, do your bit to help push it further, by re-tweeting it. It’s a 100 millisecond button press to achieve, yet it helps their Twitter account get some engagement, and it helps spread their content to your followers. There is a small amount of trickery behind the scenes, however I need to get to automating it further. At the moment, it is taking me hours a week, and I’m already time poor. The way the account currently works, is I have a tool pulling in RSS feed updates from a bunch of Perth startups that have blogs, and posting it within 12 hours into the stream. I then have a non-public list of Perth startup Twitter accounts that I try to check 1-3 times a day, and re-tweet a few tweets. I also look for the hashtag #StartupPerth, and of course, I see any mentions pretty quick. So, if you have a startup, make sure your website has a blog (content marketing is important for any startup or business generally, believe me) and a valid RSS feed. Then, hit me up with a tweet and let me know the URL. If you have a Perth startup, check out that you’re on my secret list, by either tweeting or tagging @StartupPerth. If your Twitter bio doesn’t have a location of Perth, then I’ll need to check first. Please save me the time, and update it. If you have neither of the above, you can still help other founders by re-tweeting or engaging with any of the @StartupPerth tweets that catch your eye – if every follower of this account just did this once a week, we’ll get the message about local startups out to a much broader audience. I’ll be creating some content just for this account soon, however the primary focus of this is to promote my fellow local startups, not to become yet another generic startup focused Twitter account.